Desmond 2-pc. Sectional Sofa w/ Full Sleeper The comfortable, contemporary design of this Desmond 2-piece sectional sofa with full sleeper features plush boxed seating and back cushions, giving you the comfort you desire while helping enhance your home's decor with exciting jumbo stitch detailing and tufted accents that embrace the modern style. The comfortable, contemporary design of this Desmond 2-piece sectional sofa with full sleeper features plush boxed seating and back cushions, giving you the comfort you desire while helping enhance your home's decor with exciting jumbo stitch detailing and tufted accents that embrace the modern style. Best purchased ever!! Fit perfect in my family room. The bed is perfect for visitors. I am very impress with the design and the fabric on the sofa. I am so happy that I added this couch to my home! It is the perfect combination of firmness and comfort. The cushions provide a ample amount of support while being incredibly comfy! I would definitely recommend! At first, I was very concern because of the price. I thought the quality would be questionable since it was relatively cheap (compare to other products). Anyway, so far so good! It is very big and firm, however it provides just the right amount of fluff and softness. I love it because the cloth material seems very strong and since it is dark, you wont have to be on top of it cleaning it all the time. I am in love with it. The sectional is great very comfy, but the sleeper was terrible woke up the next day in so much pain in my back. First time I slept on a pill out bed and woke up in pain. I believe the mattress is to thin, I felt the bars of the sectional in my back. Probably needs a better mattress. We purchased this not to long ago and are so happy with the couch. It was delivered in 3 days easy and painless getting it into the house, we love the way it looks in the room, it fits perfectly. 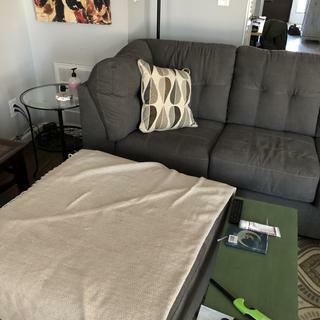 Couch is very comfortable, the sleeper is what you would expect a sleeper sofa to be, not the best bed but we have a foam topper that we throw on top and that does the trick. Nice to have the option to use it as a bed if needed, but would not want to sleep on it every night. It’s comfortable it’s pretty it’s useful with the sleeper sofa it’s great! It’s so beautiful I’m coming back to buy another one for myself!! Really nice this sofá, I love it . I am very very happy thank you Raymour and flanegan. We LOVE this couch. So comfortable, looks great, and arrived in 3 days. Really couldn’t ask for more. I was looking for a very specific dimensions. This sofa fit the bill. It’s firm yet very comfy. I agree with another review that I wish the stitching was a bit smaller but it is fine. We haven’t used the sleeper yet, but I’m presuming it’s typical sofa sleeper. Over all I would recommend this sofa. Its more beautiful from what i expected. this couch is amazing! beautiful, sturdy, comfortable and so affordable. it fits perfectly in our media room and everyone can fit on it! Run, dont walk to purchase this couch! The couch is much firmer then expected but very comfortable to kick your feet up on. Lost points for strength of the stitching. My puppy (still in training) jumped on it once and a few of the stitches in the middle of the cushion pulled out. Luckily those stitches are decorative and not essential. I was surprised it happened because of the thickness of the thread in the stitching. True to color. Great material. Easy to clean. Does not loose shape. My dogs nails picked up some of the stitching but otherwise good buy. It looks better on the website to be honest. I think it was overpriced for what I received. BEST ANSWER: The Desmond 2-pc. Sectional Sofa w/ Full Sleeper does include a mattress. What's the minimum doorway width? BEST ANSWER: The Desmond Sectional will require a 32" door opening. Is the chaise also a storage? BEST ANSWER: No the chaise does not have storage. No the set has no storage. However, it is a beautiful set. The bed is a large full size and the set itself can comfortably fit two adults laying down (opposite ends) at 6” ft. I love it. No, Unfortunately not. Would be great if they could design that in thought. no it's not but you can't go wrong with this purchase. it's the best couch! Chaise does not have storage. No, unfortunately it is not. BEST ANSWER: Yes. The seat cushions are reversible. are the back cushion attached? BEST ANSWER: Yes. The back cushions are attached. What is the shipping box dimensions of the sectional? BEST ANSWER: The Desmond is available for White Glove Delivery Service which includes all necessary assembly and a comprehensive quality inspection of your furniture prior to it being delivered to your home. With In-Store Pickup Service the Desmond will be in the original carton and the dimensions of those cartons are as follows: 3' x 7.6' x 3.3' and 3.25' x 5.6' x 3.3'. what is the mattress size ? BEST ANSWER: The dimension of the full sleeper mattress is 72'' L X 52" W X 4.25" H.
Can I order this with the chaise on the other side? BEST ANSWER: Yes, The Desmond 2-pc. Sectional Sofa w/ Full Sleeper with the chaise on the other side is SKU # 299466497. Which side is the chaise facing left or right? BEST ANSWER: If you are standing and facing the sofa, this is a right-arm-facing chaise. We also offer the Desmond 2-pc. Sectional Sofa in reverse configuration. What is the hight without legs and pillows. My door si only 29inch wide? Although every delivery situation is different, the recommended door width is 32" but this sofa does have removable feet so it should be able to fit through your doorway. Can you get sectional in leather? BEST ANSWER: Hi Donna. The Desmond sectional is only in fabric colors Charcoal and Walnut. There are no other special order fabrics or leathers. Can clearance/sale items be placed in lay-away? What is the size of the feet if I want to put felt pads on the bottom? BEST ANSWER: Ashley Furniture does not provide maximum weight capacities for their furniture. Since this is an important aspect of your buying decision, I would highly recommend reaching out to our online sales department 866.383.4484, option 3. Our sales team will be able to find a piece for you that fits your needs and person style. What is the weight capacity of each seating area? Can the feet be removed so it will fit through a 31 inch wide door? BEST ANSWER: The feet are removable. BEST ANSWER: The chaise of the Desmond 2-pc. 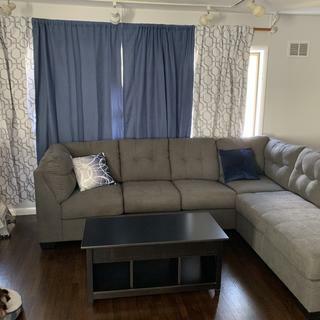 Sectional Sofa w/Full Sleeper has a length of 36" and a width of 88". The sleeper sofa piece is 80" long and 36" wide. What are the dimensions of the sofa and the chaise separately? BEST ANSWER: The individual sofa dimension is 80" L X 36" W X 38" H. The chaise is 36" L X 88" W X 38" H. Please keep in mind length is left to right when standing in front of the piece facing it, and width is from back to front. Does this two piece sectional attach to one another or just push together? BEST ANSWER: The pieces are connected with U-Clips. Does the ottoman come with it? BEST ANSWER: The Desmond 2-pc. 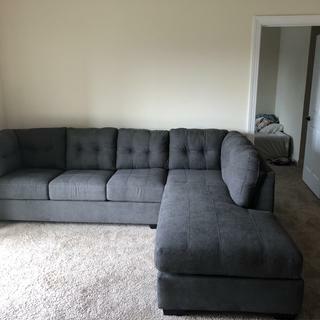 Sectional Sofa w/ Full Sleeper includes the sectional pieces only. The Desmond Accent Ottoman, SKU 214466498, is sold separately. 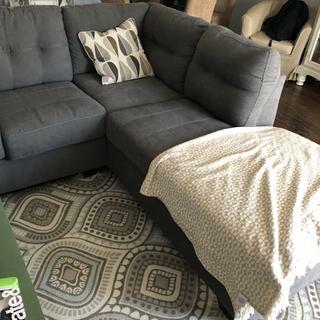 How can i find out if this sectional is located in a store near me? BEST ANSWER: The Desmond Sectional is an Outlet item and is displayed at Raymour & Flanigan Furniture's Outlet Centers. For assistance locating the nearest Outlet Center, please call 866-383-4484, option 3.
what is the depth on the non-chaise side? meaning the measurement from the back of the couch to the front end of the couch. BEST ANSWER: The sofa segment of the Desmond Sectional measures 36" from the back to the front. 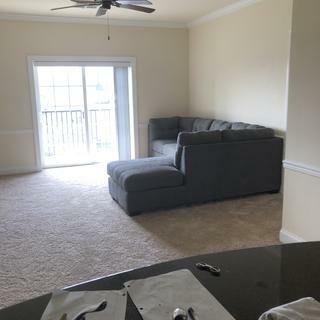 What kind of fabric is this sectional? BEST ANSWER: The Desmond Sectional Sofa upholstery is a polyester microfiber. Is the mattress memory foam and how thick is It? BEST ANSWER: The Desmond 2-pc. Sectional Sofa w/ Full Sleeper includes a bi-fold full innerspring mattress which measures 4" high. Can this be delivered to a store where I can see and then have it delivered to my home? Where is the outlet located? BEST ANSWER: For assistance with an Outlet location near you, please contact 866-383-4484, option 3.